Short winter days and cooler temperatures have us craving comfort foods that warm us up. There is no more fitting winter food than a satisfying soup or a hearty chili and no better ingredient to spice it up than beer. 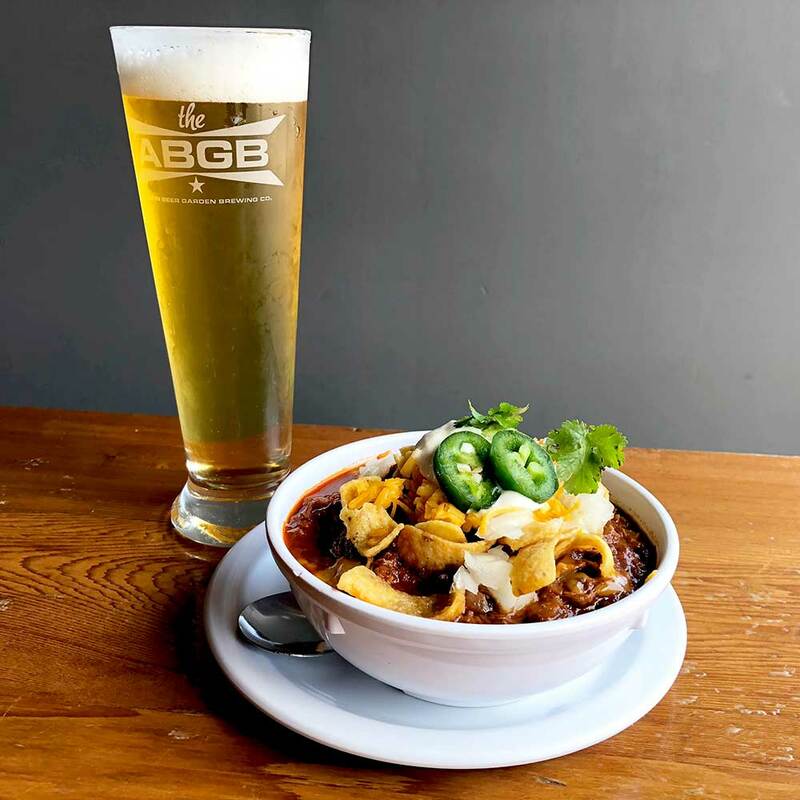 From baked onion and beer cheese to spicy jalapeno and meaty chili, here is a list of small and independent breweries who are serving up beer soups and chili to hit the spot. Cheddar Ale Soup is one of the most popular menu items at Cerberus Brewing. It’s a three-cheese soup with a base of vegetables, butter, flour and cream. More than a gallon of the Perpetual Pilsner is used for each batch. This beer soup is garnished with pretzel croutons, roasted portabella mushrooms, chive oil and fresh herbs. The Shoshone Stout is used in the hearty beef chili at this Colorado brewpub located in The Hotel Denver. The oatmeal stout, along with chipotle adobo, is mixed with garlic, bell peppers, and fire roasted tomatoes and seasoned with Chimayo chili powder and coriander. The beer cheese soup at Potosi Brewery features Wisconsin cheddar cheese and smoked gouda along with roasted red peppers. For the brew, the chef turns to Good Old Potosi Ale – an award-winning golden ale with a delicate malt flavor. Butchers Chili at Tampa Bay Brewing Co. 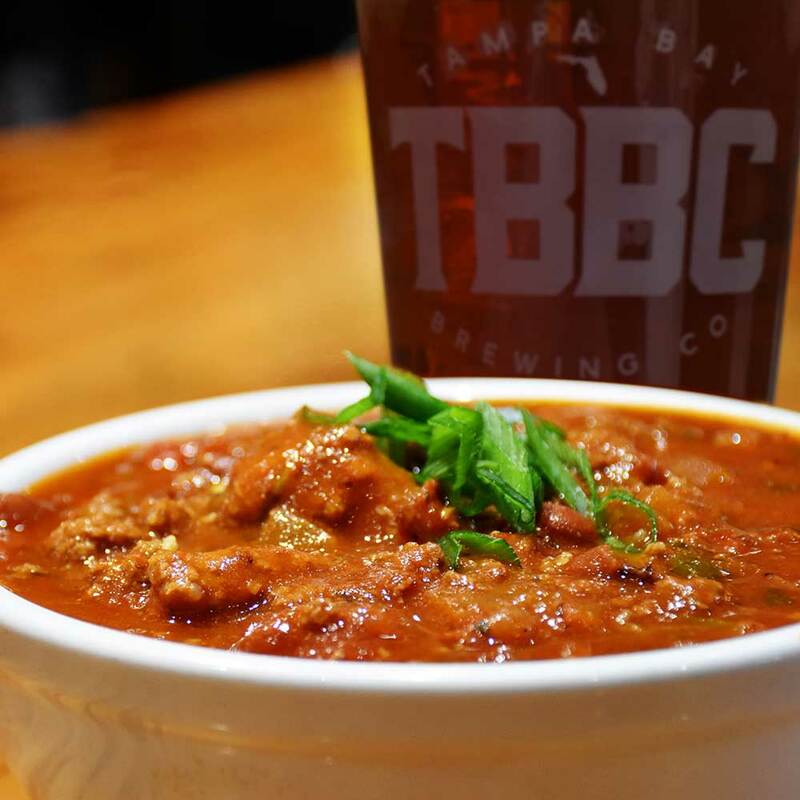 The robust chili at Tampa Bay Brewing Co.’s Westchase location is loaded with two kinds of meat – bison and Angus beef, along with onions, peppers, tomatoes, and red kidney beans. The Red Eye Amber Ale, brewed with Columbus and Cascade hops, completes the dish. At San Diego Brewing, beer is part of the spicy jalapeno soup, which is a crowd favorite. Jalapenos, cheese, and vegetable stock are combined with the San Diego Gold Kölsch. All that goodness is served in a hollowed out toasted Sourdough bread bowl. Fredericksburg Brewing uses their award-winning Enchanted Rock Red Ale in their sharp cheddar beer soup. This satisfying soup, served in a bread bowl, is also made with shredded carrots, garlic, diced green onion, and white pepper. Helles Chili at Austin Beer Garden Brewing Co. There are rotating Frito pies – chili topped with crunchy, salty corn chips – served at The Austin Beer Garden Brewing Co. Of interest. Can we explain what a “rotating chili pie” is? The latest to the list is one topped with a meaty chili made with venison and black beans. It’s simmered with Hell Yes, a GABF gold medal winning Helles, Bavarian-style lager. This Portland brewery opts for the Hefe-Weissbier, called Zoigl-Weiss, in the rich and smooth beer cheese soup since it has the most subdued hop profile. The fruity esters complement the gouda in the soup, and the nuttiness from the cheese pairs nicely with the slight clove and flavors in the beer. Baked onion soup is a staple at steakhouses, but the Redwood Kolsch Beer is added at this Flint, Michigan, brewery and restaurant. It’s topped with croutons and melted provolone and shredded jack cheeses. Bonus: Redwood shared the recipe with us so we could share with you. Find it in our recipe section. The recipe for Pumphouse Brewery’s broccoli cheddar soup has stayed the same for almost 20 years. The creamy, vegetarian soup consists of the medium-bodied Red Alert Amber Ale along with cheddar and jack cheeses, broccoli, potato, onion, celery and carrots. The addition of a well-made beer to a savory soup or chili can truly lend a whole new depth of flavor to the dish. This quintessential winter staple gets a bold kick from beer, as these soups illustrate quite well. The post Breweries Serve Up Satisfying Beer Soups appeared first on CraftBeer.com.